Few teams within an organization are as data-driven as your sales team. Each and every activity is measurable, and your challenge is often knowing what to track. With the proliferation of sales software tools like Salesforce, Pipedrive, and Hubspot, you now have more data at your disposal than ever before. The question is, do you have more control over your sales performance than before? In this post, we’ll help you unlock the power of your sales metrics using sales analytics. Read on to empower you team. Sales analytics is the practice of generating insights from sales data, trends, and metrics to set targets and forecast future sales performance. The best practice for sales analytics is to closely tie all activities to determine revenue outcomes and set objectives for your sales team. Analysis should focus on improvement and developing a strategy for improving your sales performance in both the short- and long-term. A common example of a sales analytics activity is setting role-specific objectives for your team in the form of KPIs or metrics. For instance, setting a revenue target for your sales director while setting a sales productivity goal for your account management team. If your business was a rock band, sales would be the lead singer. All eyes are on sales and revenue performance, and a strong (or weak) performance can become a potent rallying force for your entire team. Monitoring sales analytics in the form of sales metrics helps increase your performance, optimize sales activities, and improve accountability. Your sales team has a wide range of activities to focus on and operate in a fast-paced environment. A well-defined sales analytics strategy provides your team with focus and clarity so they can concentrate on doing what they do best. Data transparency when it comes to sales analytics is tricky. Many members of your team lack the training required needed to do ad-hoc reporting in CRM tools and are more focused on revenue generating activities like logging calls and completing demos. That’s fair, too. You want your best reps selling, and your sales analysis should accelerate that, not hinder that. A solution for team analytics is to display analytics on a sales dashboard. Ideally, the dashboard will be straightforward, intuitive, and communicate a clear message. This can be done using free tools like Google Sheets, PowerPoint, or Excel. Or it can be hooked up to a dashboard software solution (like Klipfolio). 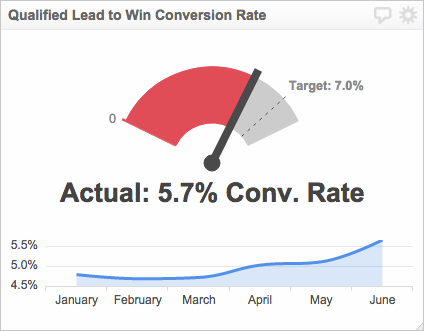 Here’s an example of a sales analytics report generated using Klipfolio. Another positive way to increase transparency and accountability for your sales analytics process is to display a sales leaderboard. A leaderboard can be displayed on a TV and used to track revenue performance against a time-bound target. For example, tracking your team’s performance towards a monthly revenue objective. When implementing sales analytics at your organization, you will want to start by taking stock of your sales metrics. Think about which metrics will inspire action and provide your team with focus. If you’re just learning about sales analytics, then you may find it helpful to review a few examples. Here are 12 sales analytics metrics you may consider tracking. Sales analysis revolves around your ability to grow revenue. A small blip in your trend line will do more than furrow brows, it’ll have your team digging through the data for definitive answers. This KPI tracks current performance against a business objective. Sales may be represented as revenue, number of accounts, units sold, or any other measure that is relevant for your team. In a perfect world, you’d be able to prioritize your sales efforts based on the likelihood to close. Barring the sudden appearance of a crystal ball, your current opportunities is the best way to track and measure that. Perform rapid analysis by comparing your current sales against the previous period, the same period the previous year, and get a sense of historical trends. For teams selling multiple products and with targets for each product, it’s important to track sales for each line. Insights like lead conversion rates help keep sales and marketing teams aligned throughout the customer journey. Conversion analytics allows for teams to continuously optimize performance to steadily improve customer experience. If you’re selling physical goods, tracking your sales versus the total inventory is an important analytics undertaking. It will inform your supply-chain and help in sales forecasting. A new product to sell may be exciting, as innovation often is, but sometimes it can adversely impact sales for an existing product. By tracking product cannibalization in your sales analytics, you can better manage customer experience. Quote-to-close is an excellent sales productivity metric because it demonstrates how effective your team is at closing a deal. This metric gives analysis into the quality of leads and the quality of your sales process. The composition of your sales team is an important factor when developing sales analytics. Experienced reps and account managers are more likely to outperform junior reps, and forecasting this into future analysis is one example of how this metric can be used. One of the most effective ways to increase sales revenue is to increase the average purchase value of each sale. Incorporating this metric into your analysis and to track historical trends is a smart strategy. Even global businesses will find they have regional differences in sales and revenue. Tracking this metric will give visibility into the territories in which you are competitive and profitable. Get smarter about your Sales metrics in daily bite-sized emails.